As usual, last Sunday, we spent a good half an hour on the couch, trying to find a restaurant to spend our evening. As you probably figure out, if you are following my blog, we do love going out for dinner on Sunday evening – it is like a nice way to conclude our week end, above all when my husband is working – BUT at the same time, in Luxembourg central areas, very few nice places are open. We decided to go for Ambrosia, a cozy Greek that open not long time ago in rue de Notre-Dame. I visited several Greek restaurants already around the city and I always avoided this one so far as it looks like a bit too posh for the situation we are usually having Greek dinners – you know, big tables, lot of different appetizers, Ouzo. 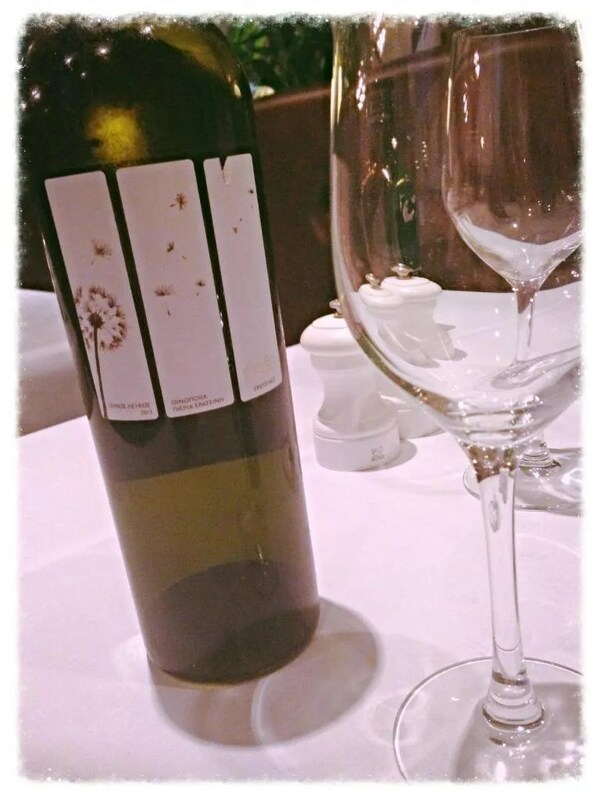 Moreover, several years ago, I had a really ugly experience at the To Kastro, a famous restaurant that used to be located in the Ilot Gastronomique and to myself Ambrosia, from the appearance, remind very much of that one – wrong idea! We called around 8 pm and we reserved a table for 9 pm, two people. No problem. We arrived on time and the restaurant was full, but not fully booked. On our side, just next to the window, we were the only persons, and we really appreciated it, because otherwise tables would have been really too close (note to self: never go there on a packed night). A smiling waiter left us the menu, similar to other Greek restaurants we have been, maybe a little bit less extensive. The atmosphere is nice and romantic, even if in contrast with the noises produced by the room – extremely loud – with some Greek music in the background. 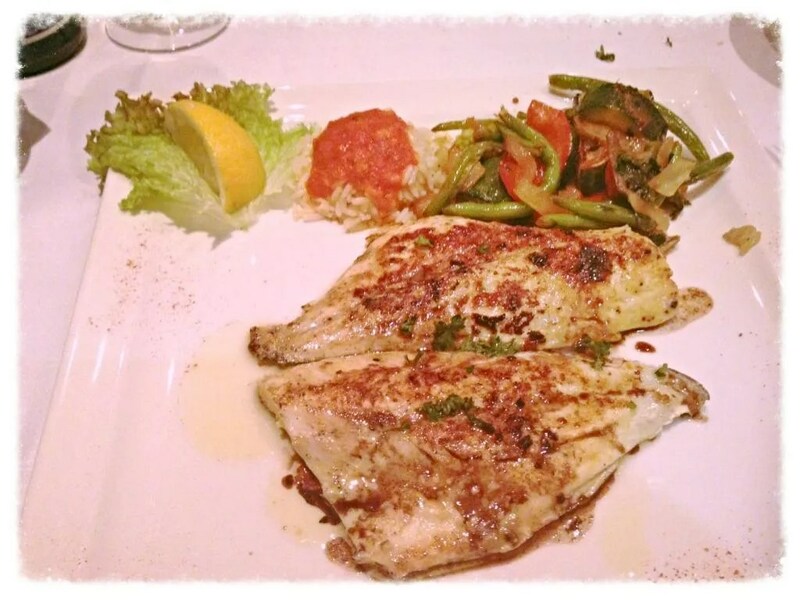 We went for two small starters, Atherina – that is my favorite, fried tiny fishes, – and a portion of marinated Octopus. The wine list was taken separately on a simple sheet a bit confused, but the waiter again was helpful. We opted for a Chardonnay, average price, that was great. I am not a fan of floral bouquet wines, but given the strong taste of most of the dishes, it was indeed pleasant. 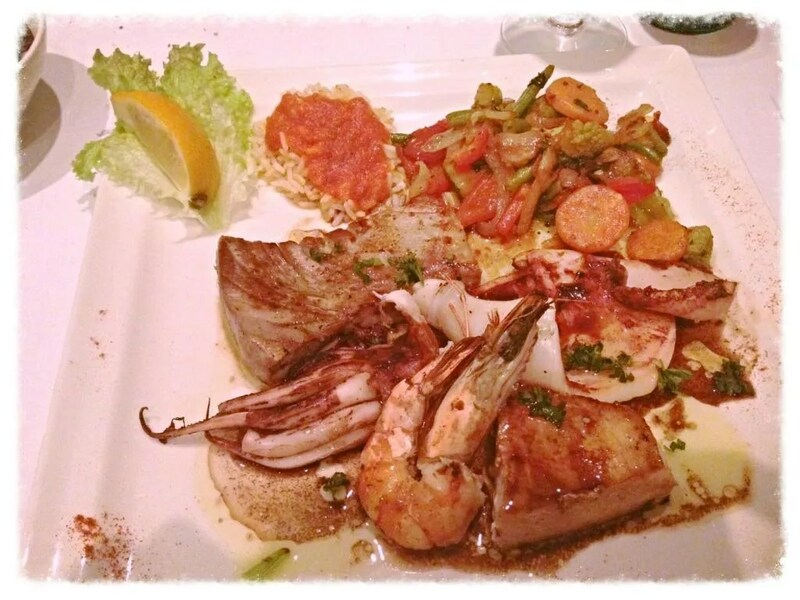 To follow, I went for the mixed grilled fishes plat, that includes tuna, swordfish, shrimp and squid. The dish was as whole good: I would say that the swordfish and the tuna were great, only one shrimp a bit narrow (maybe two next time?) while the squid was gummy – above all compared to the octopus we took as starter that was delicious. As side, there were some grilled vegetables and a tiny portion of rice with sauce. The rice was yummy as well as the vegetables. I would have appreciated a bigger side portion, but I can understand this is more a personal choice and people prefer a bigger main portion, as it was the case. My husband had sea bass and was happy about his choice. We were really full so we concluded with two espresso coffees. In total, we spent 100 euro, of which 28 where coming from the wine. Fair quality/price relationship, above all in the city center. As a small side note, the ladies’ was a total mess – this is not fully attributable to the restaurant, but if you had a busy night maybe you ensure in the middle that someone checks out the restrooms.. When you are in the city center you expect a certain level of service also on this side. I will have another try at this restaurant, with the meat next time, also to check how the situation changes compared to the clients the restaurant has. As said, the atmosphere is very romantic, but it resulted being just really loud because of people talking and music. But the food at the end was fairly good and the waiters always available and nice. In the meanwhile, do you have any good suggestion for Sunday nights? I have never ever eaten at a Greek restaurant in Luxembourg. The last times I had Greek were in Madrid and Hong Kong 🙂 Good to know that this one is open on a Sunday. I might eat there one day.